Connected has had a decent run of parties in the seven years they have been running. From Waifs & Strays to Huxley via Tom Budden, Miss Devine and Spencer Parker, the night has showcased established underground names next to up and comers at a range of venues around London. 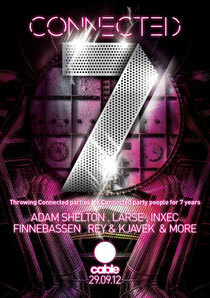 Now settled at the impressive cable, they celebrate their seventh with Below and One Records man Adam Shelton, Larse, Inxec and more. Adam Shelton’s passion for quality underground house music shines through in his DJ sets and productions. Having spent the whole of his adult life devoted to the music and parties he holds dear, Adam is the co-owner of the prevailing One Records and at the heart of his notorious Birmingham Sunday rave, Below. He’s released on labels such as 2020 Vision, Dame Music, Under The Shade, air london and Matt Tolfrey’s Foot and Mouth. Producing not only as a solo artist, but also under bubbling side project S.A.S with partner Subb-an, with tracks including ‘In the Candy Store’ and ‘House Nation’.